As I continue my work on the skull series I’m constantly thinking about how the style and pieces can be applied to other mediums. I quickly began thinking about cd covers, book covers, magazine designs, clothing, and eventually toys. I have been a longtime fan of the Dunny series created by the mighty Kid Robot. They make killer toys anyway but the Dunny line really spoke to me, mostly because of it’s cute design coupled with great designs by famous artists. 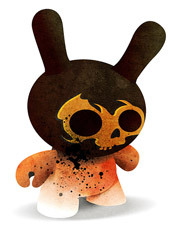 KidRobot commissions artists and designers to create their own version of the Dunny character with a blank sculpt. The artists go bananas creating the toys, then KidRobot has a release party showcasing all of the new colorful designs based on their toy. Pretty genius. So one hilarious thing led to another and a Signalnoise Dunny was created. It was a challenge to get my style to bang down to a little cartoon, but the final product is rather funny. I had a good time rendering this little guy so now I’m considering throwing together a few more Dunny designs in the future when I need a break from my more serious work.